. 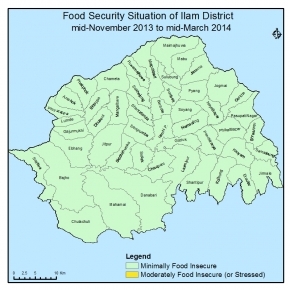 The total 48 VDCs and 1 Municipality had been classified as Minimally Food Insecure situation and availability and accessibilty to food was normal without changing their livelyhood strategies.
. Household had sufficient food stock on average for 4 months as recent harvest of paddy, millet and previous stock of maize. Market stock is sufficient for a month due to regular supply.
. High level of income through cash crops like cardamom, tea, ginger, vegetables contributes to 144 crore rupees. Similarly, sale of livestock especially meat and dairy products like milk, butter and hard cheese worth 163 crore rupees.
. Remittance also play a major role as source of income that had direct impact on livelihood enhancement and food security by which as 19 crore rupees inflow to the district.
. Wage employment mostly in agriculture sector for instance, 15,500 workers engaged itself on tea sector in which 65% are female and in private construction works.
. Market price of food commodities hiked by 5% as compared to previous cycle and by 10 % compared to same cycle last year as coarse rice price gone up from Rs. 35 to Rs. 38 on average. .Drinking water supply system had been improved as 75% HHs have safe drinking water supply system and sanitaion also improved to 74% and 5 VDCs are ODF declared.
. No severe disease , epidemics observed and wasting was found to be less than 1 % all over the district and civil security situation normal though bandha and blockades for 10-15 days.
. Food security situation predicted to remain Minimally Food Insecure (Phase I) for all 48 VDCs and 1 municipality due to HH food stock remaining for 3 months with remaining paddy stock.
. Income continious through cash crop- cardamom, tea, ginger, vegetables and NTFP- chiraito and livestock especially meat and dairy products-milk, butter, hard cheese.
. Remittance continious that support for food security owing to improve of purchasing capacity.
. Market stock is sufficient for 1 month due to regular supply.
. Wage employment opportunity mostly in agriculture sector as well as in development works and also in private construction works.